Are you worried about having power go out in your home? Do you pump your drainage or sanitary sewer? Do you have a backup in place? What do you do when the power goes out? Get out candles, pull out a small generator and pump and pray you do not flood? Stay home during the winter months and never go on holidays? power outages. The generator controller unit (GCU) will start the generator automatically and supply power to your pumps indefinitely. 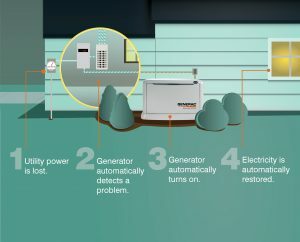 home to start your own generator. Everything is done automatically. Its that simple. your entire house. We install residential systems ranging from 6 to 20 kw, and can supply any Generac Generator. 8kw to 22kw. We also carry a wide variety of parts for repairs and service. Give us a call at 604-988-4545 to let us supply your project. it better than Perimeter Drainage.